Product #46668 | SKU 17670 | 0.0 (no ratings yet) Thanks for your rating! 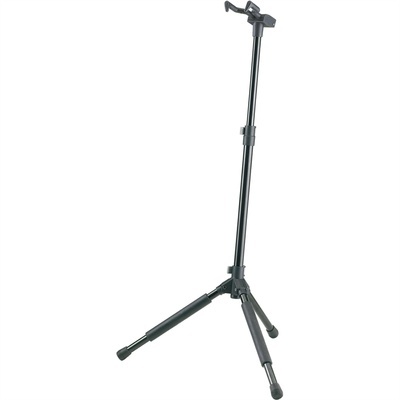 The Memphis Pro Guitar Stand from K&M is a folding stand for all guitars, that features a patented flexible "hooking-in" and clamping system that quickly and firmly grasps the guitar neck. The clamping system fits most instrument necks, and studs on the support arms provide extra protection. The stand is height-adjustable via convenient locking levers, with an anti-twist feature on the extension rod for extra safety. The robust base is very stable and the high quality non-marring rubber on the stand's neck grip and base helps to protect the instrument.